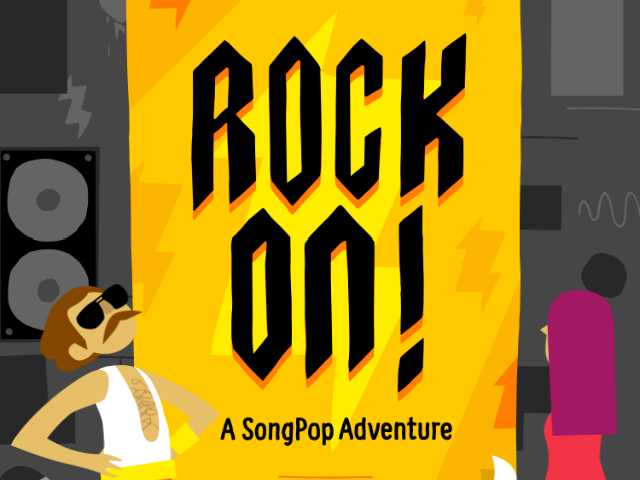 FreshPlanet announced the launch of Rock On: A SongPop Adventure on iOS devices. The music trivia game challenges players to identify song clips from more than 3,000 rock tracks. FreshPlanet announced the launch of Rock On: A SongPop Adventure on iOS devices. The company’s latest music trivia game is a spinoff of the original multiplayer SongPop franchise, and it features a single-player setup, complete with more than 80 levels of quizzes. Rock On features more than 3,000 different songs from various rock genres (classic rock, heavy metal, punk rock, indie rock, pop rock and more), and challenges players to climb the ranks of superstardom by correctly identifying song clips of these tracks. The game offers a few main quiz types, and each level can be played multiple times to experience each mode on each level. Mic Check challenges, for instance, offer 10 song clips, and players must correctly identify at least half to move on. Opener levels, meanwhile, start with a full timer bar, which quickly empties while tracks play. The faster players correctly identify tracks, the more bonus time they receive, with the goal of earning a set number of points before running out of time. Sudden Death and Arcade modes are also available. Each of the game’s levels has a theme, from “Rock Anthems” to “Hits of the 1980s,” and so on. As players successfully complete stages and collect stars, they’ll unlock additional standard levels, as well as special Artist Levels, which focus on an individual artist, chosen by the user from a growing selection of musicians. We recently had a chance to chat with Rock On game designer Nathan Jones and FreshPlanet head of marketing Bradley Cummings about Rock On and how this spinoff came about. SocialTimes: The SongPop franchise is known for its fun multiplayer matches. What inspired the team to offer solo gameplay in this new spinoff? Nathan Jones: With Rock On, we were inspired to create an awesome game world that would share our love of rock music with our players. We’re really proud of the world we’ve created, and we think our players will be, too. To really get at the feeling of traveling and exploring this world, we opted for a single-player experience that would allow players to control their own journey through the world of rock. We had to tweak the SongPop gameplay a little bit to make it perfect for the single-player experience, but it should feel familiar to anyone who has played SongPop, while also bringing new fun and challenges. ST: Again, with the original SongPop being a multiplayer experience, some of the fun was found in beating friends’ scores and earning bragging rights across quizzes. How has FreshPlanet worked to retain that level of excitement in Rock On, even in a single-player environment? NJ: Rock On’s unique game modes are incredibly exciting in that the player has complete control over their performance. As a single-player experience, your score in Rock On is entirely based on your knowledge and skill. That being said, every level and playlist in Rock On does have a unique leaderboard for you to compare your scores against your friends’. We’re still big fans of bragging rights, and it feels better than ever in Rock On to prove that you’re the very best! ST: How will players be able to spend money in the game? Bradley Cummings: You can play through Rock On without spending a dime, if you like. We worked hard to maintain that reality. However, there are ways to help out the team. We’ve got to keep the lights on, of course. The game is ad-supported, but you can switch those off with a single IAP. In Rock On, each time you fail in a level, you lose a life. These refill over time, but you can also pay to refill your lives instantly and keep playing. Lastly, each chapter contains several Artist Levels that require a certain number of stars to play. Don’t want to wait? No worries, you can pay to immediately unlock these levels and keep going.